Grandad Gifts: Grandad Gifts for Even the Most Practical Grandad! You are here: Home / Grandpa Gifts / Grandad Gifts: 5 Grandad Gifts to Please Even the Pickiest Grandfather! Grandad Gifts: 5 Grandad Gifts to Please Even the Pickiest Grandfather! Grandfathers hold a special place in their grandchildren’s hearts – so they deserve the most thoughtful Grandad Gifts you can find. Here are 5 unique gifts that will please any Grandad! What Grandad doesn’t like to show off photos of his grandchildren? Use any of Grandpa’s favorite pics to create a one-of-a-kind present that Grandad will treasure forever. Perfect gift for the up-to-date Grandpa:a custom cover for his laptop, cell phone, or MP3 player.. It only takes a few minutes to design a unique skin for any of his favorite gadget. Use a favorite photo (perhaps one of the grandkids?) – Grandad will love showing off his stylish new phone or laptop cover! Custom skins start at under $7 for cell phones and MP3s, and at $20 for photo laptop skins. Perfect for even the smallest budget! What Grandad wouldn’t want to show off his grandkids in a personalized Grandpa frame! We offer free personalization on all of our frames. Many of our frames can be personalized with the kids’ favorite name for Grandad (Grandpa, Gran-Gran, etc.). Add the grandchildren’s names to the frame for a special touch. If Grandad enjoys a special hobby with the kids, such as fishing or golfing, we have the perfect frame to showcase his skills! 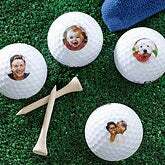 If Grandpa’s a golfer, then photo golf balls are the “par”-fect photo for him! His golf game will be even better when he’s inspired by his grandkid’s photos on these top-quality golf balls. No guarantees about the golf game improving, but at least Grandad will enjoy the round more! Photo golf balls are sold in sets of 12 balls and start at under $30. And there definitely won’t be any confusion as to whose golf balls they are! There’s something special about personalized Grandad Gifts. Personalizing a gift just takes the present to the top level. It shows Grandad that you took just a little extra time and effort to get him a unique gift. Does Grandpa have time to travel? If so, a leather dopp kit is a thoughtful gift idea. Every man needs a great way to store his toiletries, and a personalized dopp kit is sure to be a hit! Even in today’s world of airline security ziploc bags, there’s still a place for a high-quality leather dopp kit. And Grandad is sure to appreciate the timeless features of our monogrammed dopp kit! Feeling a bit sentimental? Wishing you had the right words to express your feelings of love for Grandad? 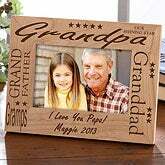 Don’t worry, our personalized Grandad Keepsakes are the perfect solution! Choose from 7 pre-written poems, or you can write your own poem. Either way, these handsome keepsakes can be personalized with Grandad’s names and signed lovingly by the grandkids. Just don’t be surprised if Grandpa cries tears of joy! These are just a few of our best-selling Grandad Gifts. Be sure to check out all the Great Gifts for Men at Mens Best Gifts today!